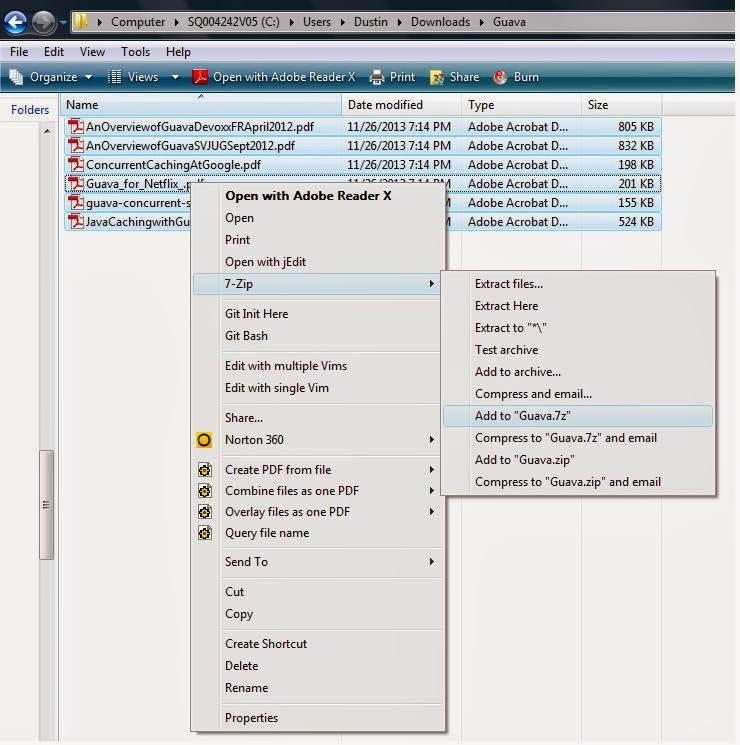 This post demonstrates a Groovy script for uncompressing files with the 7-Zip archive format. 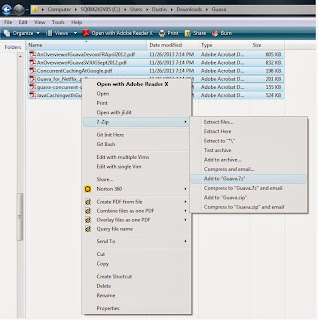 The two primary objectives of this post are to demonstrate uncompressing 7-Zip files with Groovy and the handy 7-Zip-JBindingand to call out and demonstrate some key characteristics of Groovy as a scripting language. The 7-Zip page describes it as "a Java wrapper for 7-Zip C++ library" that "allows extraction of many archive formats using a very fast native library directly from Java through JNI." The 7z format is based on "LZMA andLZMA2 compression." Although there is an LZMA SDK available, it is easier to use the open source (SourceForge)7-Zip-JBinding project when manipulating 7-Zip files with Java. A good example of using Java with 7-Zip-JBinding to uncompress 7z files is available in the StackOverflowthread Decompress files with .7z extension in java. Dark Knight's response indicates how to use Java with 7-Zip-JBinding to uncompress a 7z file. I adapt Dark Knight's Java code into a Groovy script in this post. With a 7z file in place, I now turn to the adapted Groovy script that will extract the contents of this Guava.7zfile. As mentioned previously, this Groovy script is an adaptation of the Java code provided by Dark Knight on aStackOverflow thread. Because Throwable.printStackTrace() already writes to standard error rather than standard output, I just used it directly. However, I placed calls to it in a new method that would first runStackTraceUtils.sanitize(Throwable) to remove Groovy-specific calls associated with Groovy's runtime dynamic capabilities from the stack trace. There were some other minor changes to the script as part of making it Groovier. I used Groovy's iteration on the items in the archive file rather than the Java for loop, removed semicolons at the ends of statements, used Groovy's String GDK extension for more controlled output reporting [to automatically center titles and tomultiply a given character by the appropriate number of times it needs to exist], and took advantage ofGroovy's implicit inclusion of args to add a check to ensure file for extraction was provided to the script. Although I simply added C:/sevenzipjbinding/lib/sevenzipjbinding-Windows-x86.jar to my script's classpath to make it work on this laptop, a more robust script might detect the operating system and apply the appropriate JAR to the classpath for that operating system. The 7-Zip-JBinding Download pagefeatures multiple platform-specific downloads (including platform-specific JARs) such assevenzipjbinding-4.65-1.06-rc-extr-only-Windows-amd64.zip, sevenzipjbinding-4.65-1.06-rc-extr-only-Mac-x86_64.zip, sevenzipjbinding-4.65-1.06-rc-extr-only-Mac-i386.zip, and sevenzipjbinding-4.65-1.06-rc-extr-only-Linux-i386.zip.